The world must invest $2.4 trillion in clean energy every year through 2035 and cut the use of coal-fired power to almost nothing by 2050 to slow the quickest pace of climate change since the end of the last ice age, according to scientists convened by the United Nations. The findings released Monday by the UN’s Intergovernmental Panel on Climate Change add pressure on policymakers and businesses to step up their response to global warming, which the scientists said is melting ice caps and making storms more violent. The atmosphere is almost 1 degree Celsius (1.8 Fahrenheit) hotter than it was at the start of the industrial revolution, and burning more fossil fuels will accelerate the shift toward higher temperatures, the group said in its report. Temperatures are currently on track to rise 3 degrees Celsius by 2100. That’s double the pace targeted under the Paris climate agreements endorsed by almost 200 nations in 2015. “We are already seeing the consequences of 1 degree of global warming through more extreme weather, rising sea levels and diminishing Arctic sea ice,” said Panmao Zhai, one of the co-chairs who helped bring together the report by the researchers who reviewed thousands of scientific papers. Envoys at the 2015 Paris talks asked the IPCC to study what it would take to limit warming to 1.5 degrees, a more ambitious goal than the previous 2-degree target. The scientists concluded that carbon dioxide emissions should be cut 45% by 2030 from 2010 levels then reduced to zero by 2050. That would require “unprecedented changes in all aspects of society,” most especially within the energy industry. The report acknowledged those changes would be difficult and costly, but not impossible. To limit warming to 1.5 degrees would require a roughly fivefold increase in average annual investment in low-carbon energy technologies by 2050, compared with 2015. 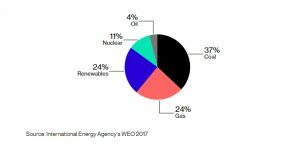 The $2.4 trillion needed annually through 2035 is also an almost sevenfold increase from the $333.5 billion Bloomberg NEF estimated was invested in renewable energy last year. — Coal’s share of electricity supply should be cut to 2% or less. — Renewables should supply 70% to 85% of power generation. — Carbon capture and storage technology should be deployed to absorb remaining fossil-fuel emissions. — Natural gas could maintain an 8% share of electricity generation if CCS reduced total global net emissions to zero by 2050. 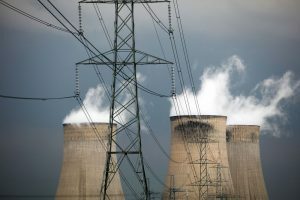 Those ambitions would mark a massive upheaval to the energy system, with coal currently accounting for about 37% of power and gas at 24%, according to the International Energy Agency. The report was meant to ring alarm bells about global warming, noting that temperatures are likely to be 1.5 degrees higher by 2030 to 2052 based on current commitments to reduce emissions made under the Paris deal. While an increase of that magnitude would boost sea levels by as much as 77 centimeters by the end of the century, that would be about 10 centimeters lower than at 2 degrees, the report said.